If you directly linked to this thread, please visit our Fox Factory Service Information - Main Index for additional resources. In the Fox RP23 shock I had, the propedal was not at all propedally... With no air in the positive chamber, I could compress the shock by hand and feel the propedal switch had no effect on shock. I considered sending it off to Push for a rebuild. That certainly would have been the easiest thing to do. Finally, I decided to try and fix it myself. I figured the worst that would happen is I just put everything back together ("as-is") and then send it off to Push. You know, make them earn their money. Much reading of the interwebz suggested the IFP chamber had lost pressure. This shock (as well as many others in the Fox lineup) requires a nitrogen needle, a slotted 4mm hex wrench, and a replacement rubber puck to re-inflate the IFP chamber. 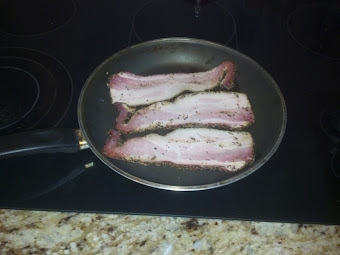 I wanted to spend as little money and time as possible on this experiment. So, I set out to find another route. 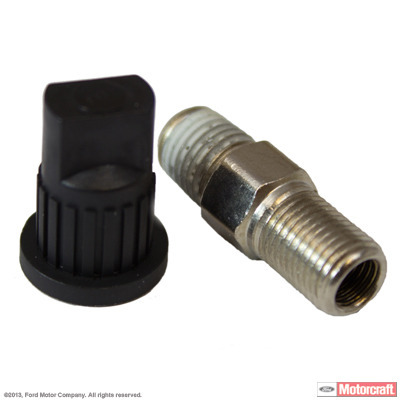 Over on emptybeer, there was a sharp-eyed fellow who realized a fuel rail pressure relief valve from Ford V8 engines had the same threading as the 4mm IFP set screw. Woah! 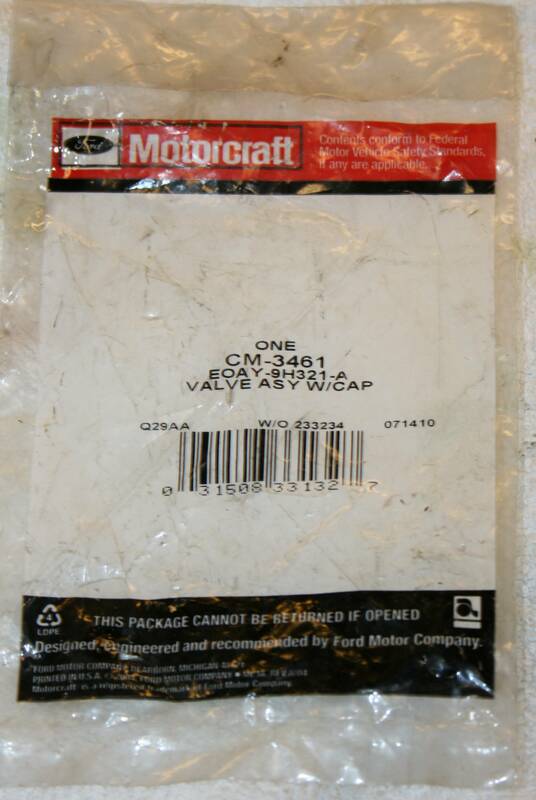 Since I didn't feel like slumming around the local pick-a-part salvage yards, I started googling Ford fuel rail diagrams and determined the part was a Motorcraft - EFI Auxiliary Valve (CM3461). I went out and bought one at my local auto-parts store for $7.99. Fox doesn't publish a manual for servicing the IFP chamber. 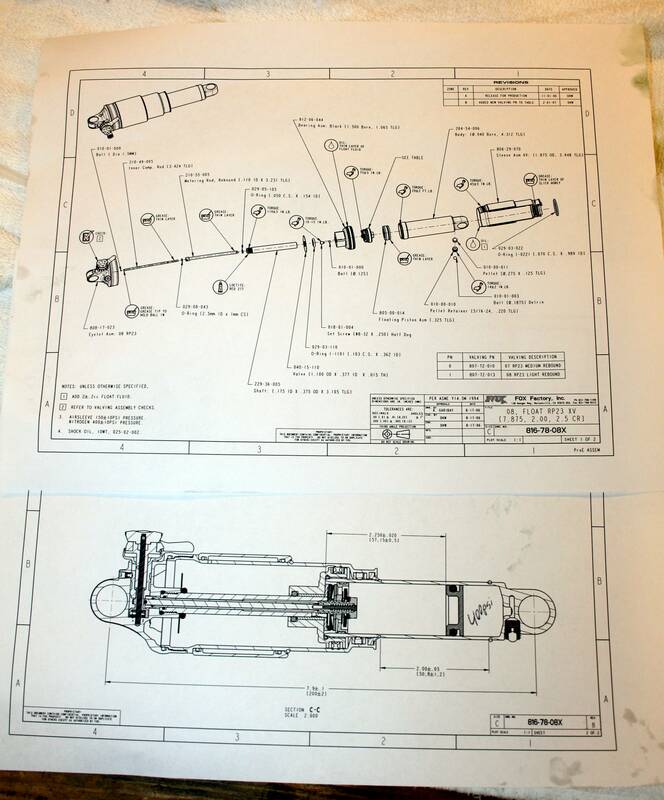 More searching and I found the exploded diagrams for my RP23. It showed all of the torque specs and the IFP depth necessary. Armed with a diagram, I'm invincible! I removed the IFP port set screw and rubber puck. 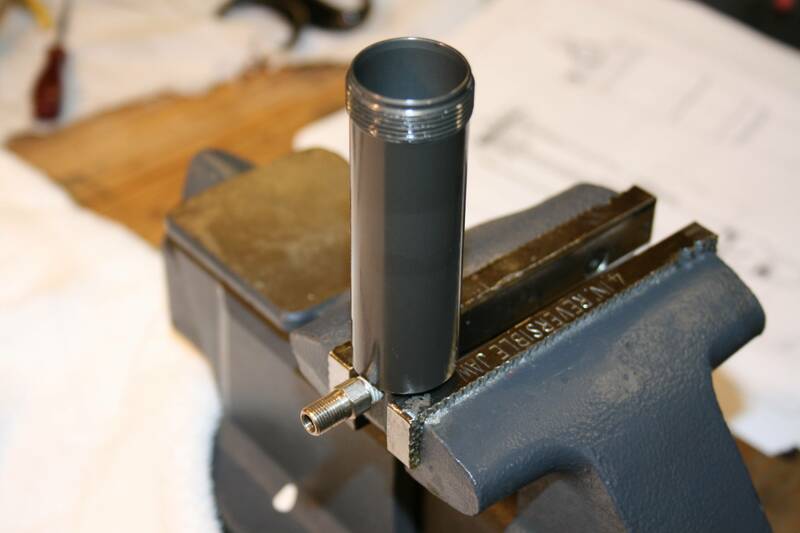 Drilled a 1/16" hole in the puck, reinserted it, and screwed in the CM3461 on top where the set screw was previously. You should note that the schrader valve on the CM3461 is long enough that the high pressure pump doesn't engage with the valve core. Still works fine, though. 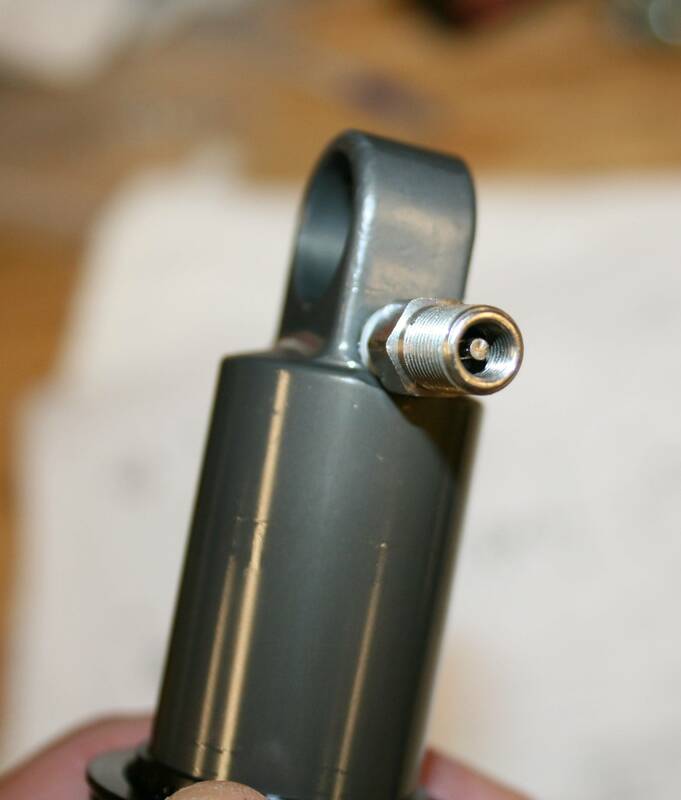 After some playing around, I determined that if I screw in the CM3461 finger tight, and then give it another 1/2 turn with a wrench, I could pump air into the IFP port without any leaks. And, if I turned the CM3461 another 1/2 ~ 3/4 turn, the puck would compress enough that I couldn't pump any air into the IFP chamber. This was a nice discovery as it gave me a 2nd level of protection from air leaking out of the IFP chamber (compressed rubber puck and the valve core). I set the IFP to the proper depth (2.25" in my case) and filed the reservoir with 5wt fork oil. 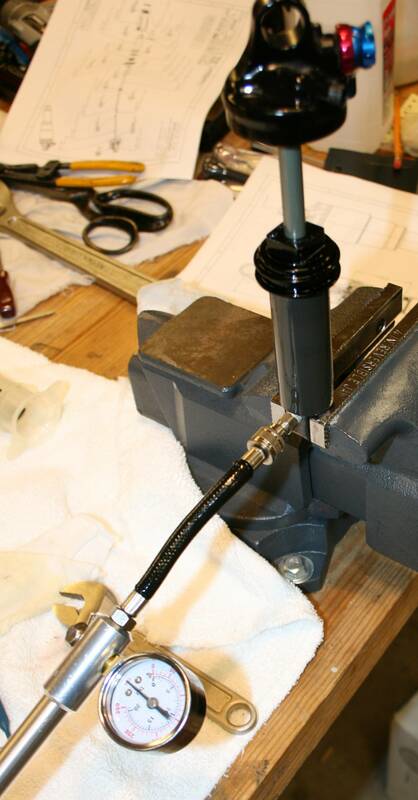 Then I carefully screwed on the cap and filled the IFP chamber to ~400psi. Although pure nitrogen is called for, I used a custom blend (78% nitrogen, 21% oxygen, 1% other) in my shock. 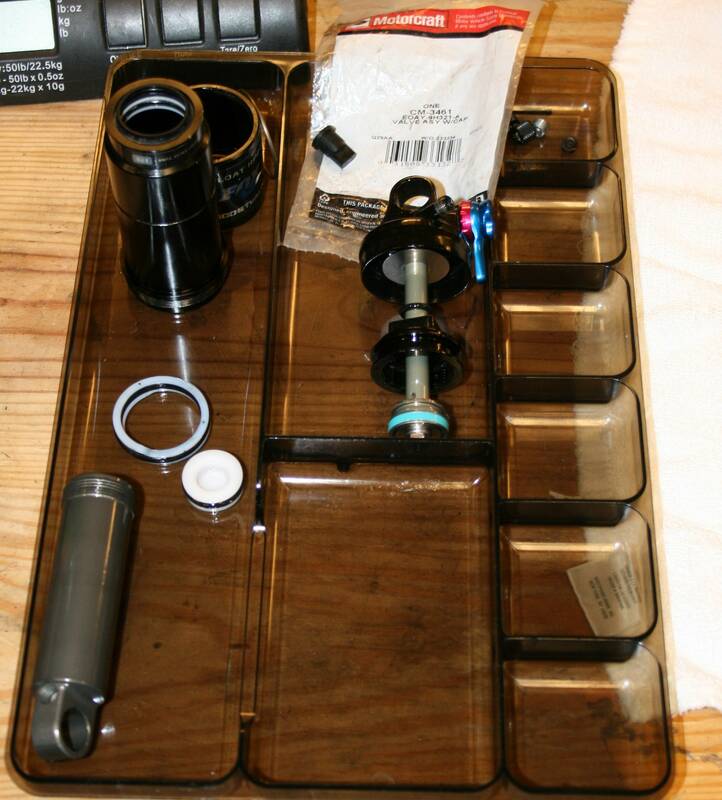 Regular old air works fine in the RockShox IFP chambers, I'm sure it'll work fine in here also. 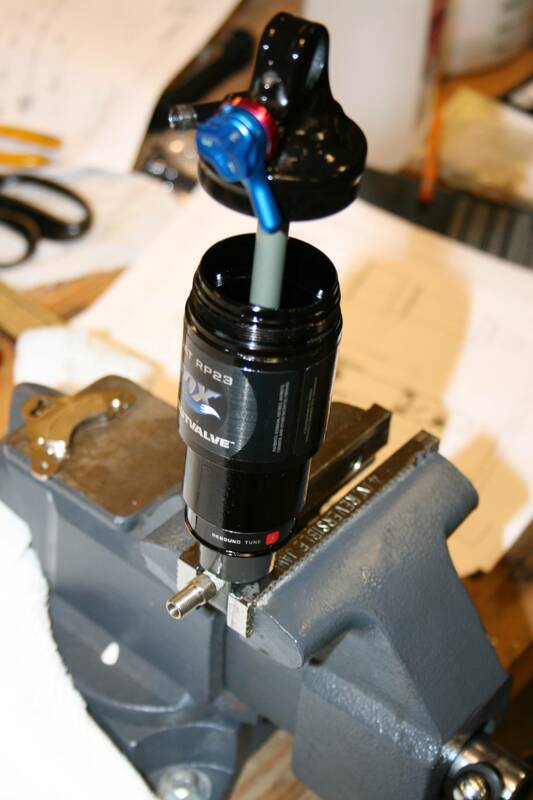 Once pressurized, I compressed the shock several times (open, and in each of the propedal modes) to try and dislodge any air trapped in the shim stack. Then I depressurized the IFP chamber (do not cycle the shock with the IFP chamber depressurized, you'll screw up the IFP depth) and removed the set screw and ball bearing on the cap to access the reservoir. Using a hypodermic needle, I injected additional 5wt fluid in until all of air was out. Replace the ball and set screw (don't cycle that shock). Remove the CM3461. Re-install the sleeve. 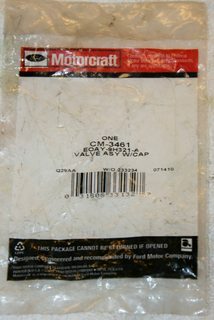 Re-install the CM3461. Re-pressurize to 400psi. Now you can cycle that shock. Feels good, doesn't it? Before disengaging the pump from the valve, use a wrench and give it another 1/2 ~ 3/4 turn to compress the puck and help lock in the air. Then, remove the pump from the valve. Cycling the shock by hand (with no positive air pressure), I'm amazed at how well it works. With propedal open the shock is silky smooth on the compress and rebound stroke (rebound actually works, also). When set to the 1st level of propedal there's a noticeable "shelf" that you must press past before the shock resumes normal compression. And, at the 3rd level of propedal I can't compress it by hand. 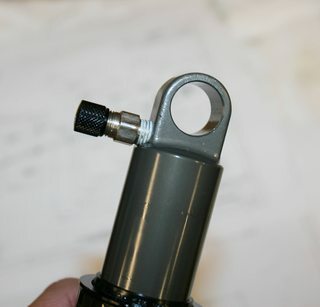 Close-up of the CM3461 installed on the RP23. 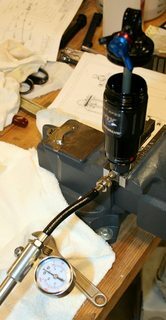 I happened to have a nice cover (labeled "- Air", from my SID rebuild kits) to put on the new valve. For a total expense of $7.99 (not including the small amount of fork fluid) this worked out very well and it didn't take much time. I'll report back in a few months with how it's holding up. If it looks like it's fixed for the long term, I'll probably invest in a real inflation needle and some o-ring cord to make the rubber pucks. 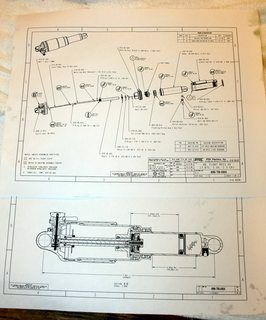 In case anyone else is interested in this modification, I found (and downloaded) the diagrams for several other models of Fox shocks. I also found a spreadsheet (looks like it's from Fox) that gives the IFP depth and psi required for a ton of different Fox part numbers. Let me know and I'll look up whatever you need or try to put the spreadsheet online somewhere. Feel free to ask if you have any questions. Oh, and you can click on any image above to get a full size view. wow. pretty AND smart. where does a person get 400psi air? The reasoning behind Nitrogen is for consistency (easier to predict the thermodynamic properties for a "pure" gas than a mix), same goes for pure Argon. Air works almost as well but the pressure has to be adjusted depending on environmental conditions. Interesting. I may be trying this out soon. Out of curiosity, what pump did you use to get to 400psi? Would a CO2 cartridge work? Well done marps, well done. It's only like 6 bar as I recall. Too bad the N2 cartridges wouldn't work either. That's actually a nice mod for the shock. 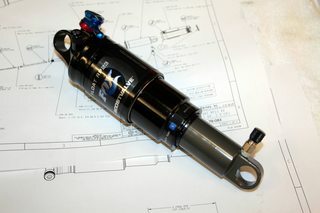 Although they do sell shock pumps that go to 400psi, mine only reads up to 300psi. It's an older RockShox high-pressure pump which is basically an un-branded Buzzy's Pollinator shock pump. To get to 400psi I made an educated guess and kept on pumping until the mark reached the spot I wanted. It's probably more like 350. You know, "220, 221. Whatever it takes." I can just keep adjusting it until I'm happy with how it rides. 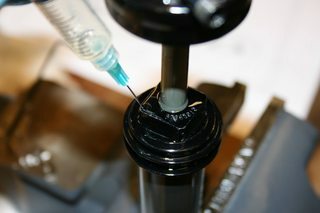 I was browsing through the PVD wiki on suspension fluid (http://www.peterverdone.com/wiki/index. ... sion_Fluid) and noticed it said that Fox 10wt suspension fluid was measured at 47.36 cSt @ 40C. 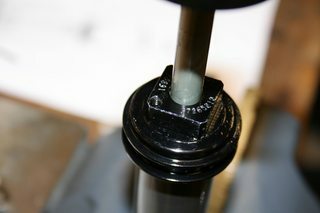 In the official RP23 rebuild guide, it calls for Fox 10wt oil in the damper. When I refilled the damper I used Torco RFF 7 which is 16.10 cSt @ 40C. Hmmm, this could be why I have to really turn up the rebound to make a difference. 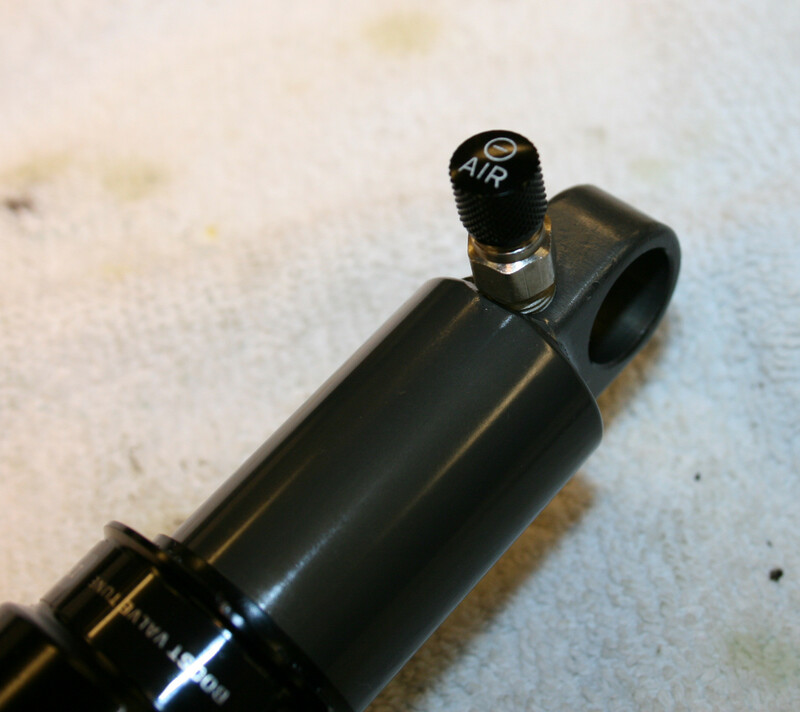 I have some Torco RFF 20 (actually RockShox 15w) on the shelf which is 42.80 cSt @ 40C. Much closer to the official Fox 10w. So, I'm going to break it down again and put in the Torco RFF 20. I've been wanting to use that new 400psi fork pump anyway. I replaced the damper fluid with the Torco RFF 20 tonight. And, I was able to pump it to 400psi with the new fork pump (thanks, Joe!). At 400psi, the switch on the shock is very stiff. It offers a fair amount of resistance when switching it into propedal. And, it "snaps" and springs back to open when you switch it off of propedal. If you're experiencing pedal bob, and the switch doesn't feel as responsive as it once was, you've lost IFP pressure. Plain and simple. Same issue with non-popedaliness. After gathering all of the proper data and equipment, I decided to take the lazyman approach and perform the Schrader mod without pulling the shock apart. O'Reilley's was able to get the valve delivered to a local shop withing 12 hours. Matty, welcome! Glad to hear that it helped. I think the IFP port losing pressure is more common than we think. Once I started looking for this kind of problem, I found many posts where people sent their RP23's off for rebuild because a simple canister seal change didn't help. I'd bet most of these are related to IFP pressure leaks. 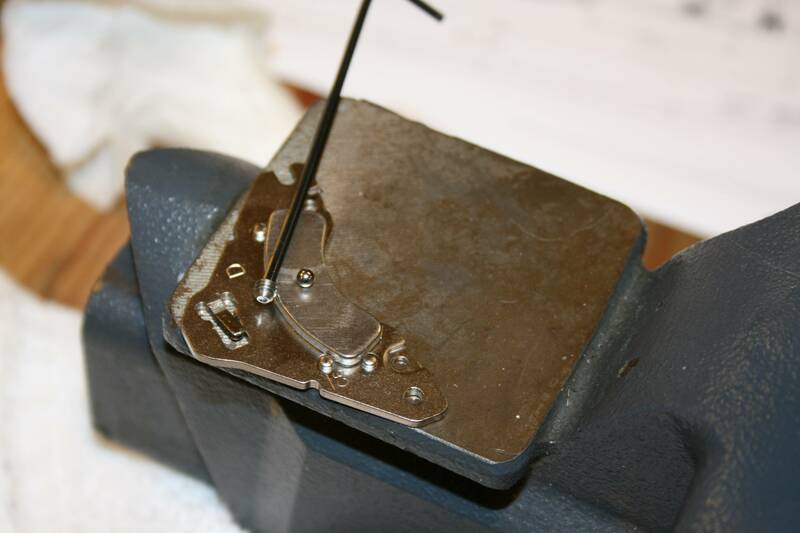 I don't think there's pressing reason to disassemble the shock to try the fix (you took the right approach). After all, if it doesn't help, then you can take a shot at opening it up. My RP23 made "squishy" noises when compressed and I read that was due to cavitation of the IFP fluid. That's what lead me to open it up completely. I have a tendency to go too far with my projects, anyway. The IFP gets eventually worn and starts leaking around its circumference. Craig at AVA replaces the factory IFPs of DHX shocks with his better design in his conversions. Btw. 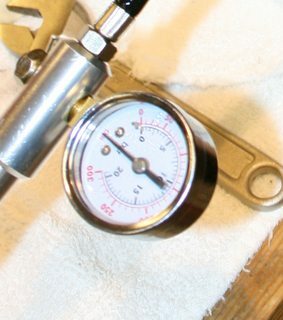 the right way to measure pressure in the IFP chamber is to remove spring / release air and press the shock against a personal scale. My DHX 5 with Nitrogen charge should register about 40lbs. The volume of gas in the chamber is so small that an attempt to measure it with a gauge will result in its complete release. Marp, maybe you could explain this but since I've had my SF with the RP23 there is a dead spot for the first 5mm of travel. Like no damping. Unnoticed while riding and has never been a problem but when first mounting you can feel it or when setting the sag. I've read else where about the same problem but no good responses. Some tore it apart to have it happen again, others it went away or was less. BTW it's a RP23 boost valve. Basically like this without the clunk but it doesn't extend weird or anything when you pick the bike up. Nor is it stuck down. It returns fine after getting off or while riding. It's the first time you put weight on it. There is a noticeable non restrictive movement for about 5mm then you can feel it work like it's supposed to. Nice job, i had a problem with my rp23 which lots of oil slip out from air valve. The moment i open up the airsleeve, huge amount of suspension fluid leak out. So, i suspect oil leak out from bearing housing seal. Appreciate anyone here could give me some idea where could i get those damper seal from online store. I had the airsleeve rebuild kit but unable to source for the damper piston seal and damper shaft seal. Many thanks. Thank you for the compliment. Up at the top of this thread, there's a link to the "Fox Factory Service Information - Main Index" and that has a link to the "Fox Rear Shox Part Numbers and Drawings" thread. In there are exploded diagrams that give the specifications of the o-rings. With the correct specifications, you might have better luck calling around. Which RP23 do you have (example: 7.875" x 2.0")? I can help you find the correct diagram. Thanks a ton for posting all this detailed information! I performed this mod to my RP2 - it fixed my rebound damping issue. I purchased a rebuild kit (air side), a 400psi shock pump, the valve (on amazon). I had some 15wt rockshox oil. It took about two hours of labor form start to finish. I tired the hypodermic needle method of air purging for the ifp side... but the oil was too thick to fit through the needle of an over-the-counter diabetic needle. I overfilled, screwed the top on and the excess spilled out the small vent port on top. Seems to be fine. So far, so good. I'm psyched to be able to service this myself now. Sending it to push would have taken too ling and required too much $$. Anyhoo... thanks. I learned something. Dude, that's awesome! Thank you for taking the time to join. Apologies for the late approval. Does anyone know how much oil should be poured into the IPF chamber for RP23 with 50mm travel? I have DRCV version, but that should't do a difference. Maybe there is some trick to measure proper amount of oil for this shock? Sorry for the late reply. I've always filled the IFP chamber completely with oil. AFAIK, there should be absolutely no air in the IFP when done. See my notes above where I cycle the IFP (while pressurized), depressurize it and "top off" the IFP reservoir.